Camber Option: Multi-camber. A camber 2.0 with a minimal rocker zone in the tip and tail. Conditions: Overcast skies, snowing with heavy wet snow, perfect groomers, low to moderate visibility, and warmer temps. Flex: The overall flex of this board is perfect middle of the road all mountain freestyle. You have play in the tips and then it stiffens up through the middle. There’s a fair amount of torsional flex to it as well. What’s unique about this board is the flex point in the nose and tail, it’s almost like a kinked flex point. This lets you get your weight out over it and it will aggressively flex but then lock in and hold a press. Stability: This board is just beyond moderately stable. You will see a little bit of flapping in the tip and tail at high speeds but that doesn’t fully resonate back under foot. In rutted out terrain and full blown chunder it doesn’t get bucked around. Ollies: This board has snap from its camber profile. It’s very easy to load up and engage which makes it ideal for setting up at the last minute to launch a roller, cat track gap, or side hit. The snap is ample and you won’t have to worry about if you will or won’t make it over anything in your path. Pop On Jumps: This board is a fully capable jump board. It snaps off the lip with ease and has so much rebound and energy that it turns little jumps into booters. Butterability: Lets talk about the flex point in the tip and tail here. When you engage it and believe me you will, it locks in to a press and holds it. This board is such a capable deck for buttering that even though it’s got a middle of the road flex you feel like you’re playing around on a board that’s a jib stick. The one caveat I have is that this board out of the wrapper is far more aggressively tuned than most and the edges are razor sharp. Jibbing: Once again that flex point in the tips is where you want to engage the board and it will lock in and hold presses with ease. Getting sideways this boards camber profile hugs features and you feel locked in. Carving: If you like tight quick carves this board has you covered and if you want to do long drawn out ones, go for it. This board steers relatively close to under foot which makes it more nimble than say something that is fully traditional camber. When on edge it locks in and pushes through everything in its path. 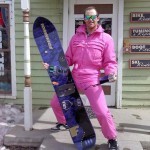 Rider in Mind: All mountain freestyle guy that wants to pop but also play around. Personal Thoughts: That flex point in the tip and tail is just so unique with how it locks in and stays that way till you want to disengage it. It’s one of those decks where it’s playful where you want it but has the power where you need it. Overall after about 4 laps it felt like a board I had ridden a whole season and I knew how it was going to react. As previously mentioned though, detune the edges as they are aggressive! Support your small snowboard manufacturer buy here. Nice. Did you get on the Vantage or Chase? I got on the 2020 versions, so those reviews will drop later.